The diet of the polar bear (Ursus maritimus) under captive conditions differs from that in the wild. The wild polar bear feeds itself predominantly on the ringed seal (Phoca hispida), but they may also eat birds, grasses, moss and berries. In the zoo, it is not possible to provide the polar bears with ringed seals. Mixtures of slaughter by-products, vegetables and commercial dog food are often supplied. In this study results, obtained on a digestibility trial of a mixed ration in three captive polar bears, are discussed in relation to possible feeding strategies and daily energy requirements of three captive polar bears. Crude protein digestibility is about 7 - 10 % higher than reported previously. Apparent digestibility of crude fat was 95 % intake. 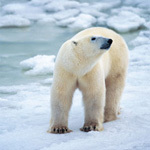 The polar bears consumed a diet containing 390 g/kg DM crude fat and 370 g/kg DM crude protein. The daily protein intake was of the polar bear was 11-13 gr/kg metabolic weight. On average, the apparent total tract digestibility of crude fiber was 52% of intake. The average daily energy intake with protein, fat, and non-structural carbohydrates by the polar bear was 46 MJ metabolic energy, which is equivalent to 766 kJ (182 kcal)/kg metabolic weight. The polar bears consumed on dry matter basis on average 62% of all feed supplied. The principle is to offer a variety of foodstuffs on which the animals can make their own choice what to eat. It is suggested that a balanced diet from which the animals can make their own choice to a limited degree should be preferred.